In the hands of Gramcracker25. Use TB2YA50 to reference this item. This coin has been released as part of the Bike Awareness Project. 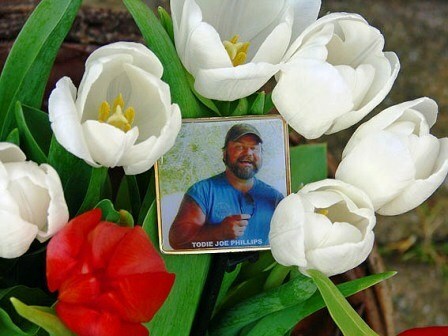 It is a project initiated by USA geocacher Rockin Roddy in response to the death of his dear friend and caching companion Tod Phillips who was cut off by a left turning vehicle too much in a hurry to notice oncoming traffic. Tod died on August 12, 2008. Tod left behind a wife and two kids. At this moment there are travelling more than 800 coins to help being aware of the more vulnerable travic participants. Besides bikers those are also scooter drivers and cyclists. The project is about what you can do to start the discussion to get travic a little saver. This is for a good awareness! I will drop it off on the way back up to Wisconsin! Saw it at the rest stop. Nice personal coin with a worthy cause. Tftc! Picked this one up in Grayslake,Illinois and will be moving it South/Southwest in the next week or so. We plan on a two week vacation hitting Indiana,Tennessee,Kentucky,Georgia,Florida,Louisiana, Texas, Oklahoma,Missouri,Arkansas,Iowa and finally back home to Illinois, so it's a mystery where this one is going to end up. Looks like it's been traveling quite a bit. Will move it along soon. Thanks for placing it out in the wild for us to find. And thanks for the message about being aware when traveling. A very good message for everyone to take heed. I needed a hammer to get the container free, but I got it out and will move this along. The roads were wet today. The only reason I went out was to pick up someone at the airport. I didn't get to as many caches today as I originally planned, but I always slow down when driving under these weather conditions. I'll get the coin safely to another cache soon.